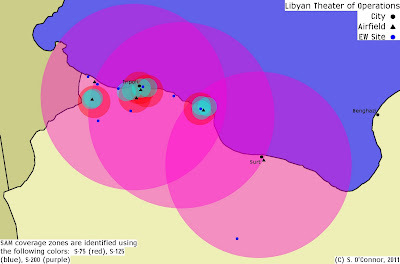 On 17 March 2011 the UNSC voted to enforce a No-Fly Zone (NFZ) over Libya, in response to the conflict between Qaddafi's regime and separatist forces. The Libyan military operates numerous Soviet-era strategic SAM systems which represent the most likely threat to allied aircraft enforcing the NFZ. Libyan SAM systems include the S-75 (SA-2 GUIDELINE), S-125 (SA-3 GOA), and S-200 (SA-5 GAMMON). Numerous AAA, MANPADS', and tactical SAM systems are also operated, but represent a considerably reduced threat given their limited effectiveness above 20,000 feet. The graphic presented below illustrates the pre-conflict state of Libyan strategic air defenses. Major military airfields, active EW radar sites, and operational strategic SAM coverage zones are marked. It should be noted that the graphics presented here depict identified dedicated EW facilities. Many SAM batteries possess their own organic EW elements; simply targeting the known EW facilities does not necessarily prevent the SAM force from receiving the target track data necessary to prosecute an engagement. 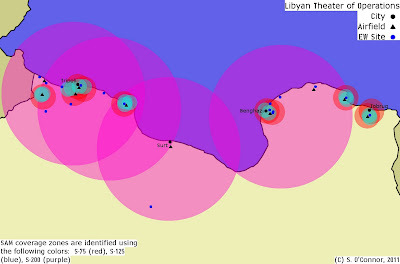 The majority of contested territory is along the northern coastline of Libya, shown in the graphic below. This is advantageous to any allied aircraft entering the theater of operations, as they do not have to travel deep into Libya to enforce the NFZ in support of separatist forces. Furthermore, ISR and support aircraft can be operated offshore under the protection of CAPs and naval air defense systems. Separatist forces are concentrated along the eastern coastline of the nation from Benghazi to Tobruk and the Egyptian border. As the air defense forces in these regions are likely no longer under Qaddafi's control, the graphic below indicates the likely pro-Qaddafi SAM threat picture facing NFZ operations. Numerous SAM garrisons and unoccupied, prepared strategic SAM sites present an opportunity for pro-Qaddafi forces to reinforce their positions prior to the start of NFZ operations. Reinforcing the strategic SAM network in this fashion will present an increased SAM threat to allied aircraft and offer increased overlapping coverage zones around key military installations. A potential reinforced pro-Qaddafi SAM network is illustrated in the graphic below. The majority of the command and control facilities for the pro-Qaddafi regime, as well as the seat of power, are consolidated in and around the capital of Tripoli. 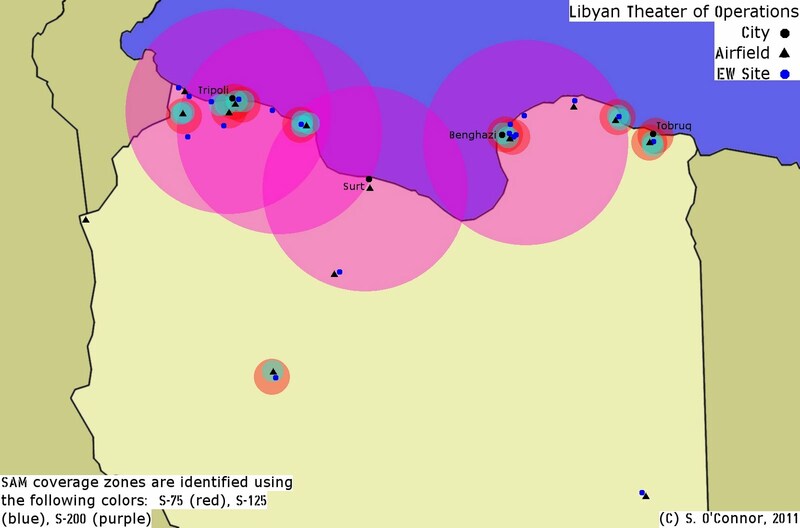 The following two graphics depict the current operational SAM network around Tripoli, as well as a potentially reinforced network employing currently inactive positions. The true nature of the SAM threat to NFZ operations will become apparent when operations commence. Should allied forces choose to enforce the NFZ over the entire region, it is likely that SEAD or DEAD operations will commence against the bulk of identified pro-Qaddafi SAM sites. However, should NFZ enforcement be limited initially to protecting separatist-controlled areas in the eastern portion of the nation, it is possible that few of the pro-Qaddafi SAM sites would be targeted as they would be unable to engage allied aircraft. The exception to the latter scenario is the S-200. The S-200 enjoys a 250 km range against cooperative targets such as ISR and support aircraft. Given that allied aircraft will likely be based out of European territories or operate from USN CVNs, heavy use of inflight refueling should be expected. Eliminating pro-Qaddafi S-200 batteries would enable allied ISR and support aircraft to operate much closer to the Libyan coastline. Should allied forces choose to enforce the NFZ over the entire nation and consequently engage active S-75 and S-125 SAM batteries, the capability of the pro-Qaddafi SAM network could be significantly degraded with a relatively small number of sorties. The Libyan SAM inventory is constrained by the reliance on Soviet-era systems. The S-75, S-125, and S-200 are limited by the fact that each engagement radar can only prosecute a single target. S-200 batteries are often bolstered by multiple 5N62 (SQUARE PAIR) engagement radars to allow the battery to engage multiple targets, but the single-target limitation significantly reduces the effectiveness of the network as a whole. Furthermore, over-reliance on aging technology places the network at significant risk for electronic warfare interference. The US military, for example, has faced the S-75 and S-125 over Iraq and the former Yugoslavia and is well-versed on countertactics and electronic attack procedures to mitigate the threat posed by such systems. While measures may have been taken to allow the S-75 and S-125 to remain viable in Libyan service, at this point they do not present significant risks to a modern military force. That is not to suggest that they present no risk whatsoever, but rather that they are no longer considered to be high-threat systems based on their age and known technical performance. Aerial attacks against separatist positions appear to have been curtailed in favor of ground assault and artillery bombardment. In this light, the provision of the NFZ calling for protection of civillian under threat from pro-Qaddafi forces could allow operations over regime-controlled areas. A potential military campaign could begin with strikes against SAM positions and EW facilities, followed by strikes against pro-Qaddafi forces threatening or engaged with separatist forces, particularly those near Benghazi. Given the limited number of SAM sites located in territory held by the Qaddafi regime, it is likely that the capability of the strategic SAM network to prosecute targets could be significantly curtailed within 24 hours. Cruise missiles could be employed to strike identified SAM sites, forgoing the expense of a significant SEAD or DEAD operation and allowing combat aircraft to be tasked to protect separatist forces. With the decision to enact a NFZ over Libya, the strategic SAM network represents the most significant threat to allied aircraft tasked with its enforcement. However, due to the single-target engagement capability of Libyan S-75 and S-125 batteries, the network is far less capable than it appears at first glance. Libya negotiated for the purchase of S-300PMU-2 (SA-20B GARGOYLE) advanced SAM systems from Russia in 2010 but at this date no sale has been completed and no deliveries have been reported. Had Libya moved to upgrade its air defense network in recent years, the issue of allied aircraft enforcing a NFZ could have become a far more complicated task. Once again, a nation relying on an aged air defense network will potentially be at risk in large part because it failed to upgrade its capability. As an interesting footnote, it will be important to monitor Iran following the cessation of action against Qaddafi's regime. Perhaps the destruction of yet another aging air defense network will be the final catalyst pushing Iran to modernize it's own defenses. Positional information derived from Google Earth. Range data used to create engagement zones sourced from Jane's Land-Based Air Defence. Graphics created using GIMP 2.0. Hi Sean, more than 110 Tomahawk cruise missiles have been launched on Libya, most of them probably on SAM sites. CNN just put up a graphic of the SAM ranges in Libya... S-125, S-200 and S-75. S-125s in blue, S-75s in red, S-200s in pink. Same as your colors. Same range rings. Might want to shoot an email to the producer in Atlanta and see if they got a hold of your SAM file or this analysis. Great analysis Sean! I was very impressed with your one on the Nork's air defense systems too. I wonder how much damage the Libyan SAM network has already suffered at the hands of the 110 Tomahawks fired by the USN. Regime change Libya and knock the mad dog's regime out. "Separatist forces" is a bit of a strange label, Sean. "Rebel" or "opposition," perhaps--but they certainly haven't demanded that eastern Libya "separate" from the rest of the country. Good point, opposition fits better than separatist. I find it more than a little troubling that for the most part everyone is onboard with the bombing of Libya. Did I miss where he was a threat to our national security? Who are the rebels/opposition forces? When are we going to learn the lessons of our past? Like it or not Libya is a sovereign entity. If the opposition want change then so be it, but its going to have to come from them not us (coalition, NATO, UN, etc., etc.)! Tactical SAMs like the SA-6 and SA-8 were left out because they are harder to target and can be overflown in many cases if required, reducing their effectiveness. I wonder how much damage the Libyan SAM network has already suffered at the hands of the 110 Tomahawks fired by the USN.